Liacarus subterraneus, copyright R. Penttinen. 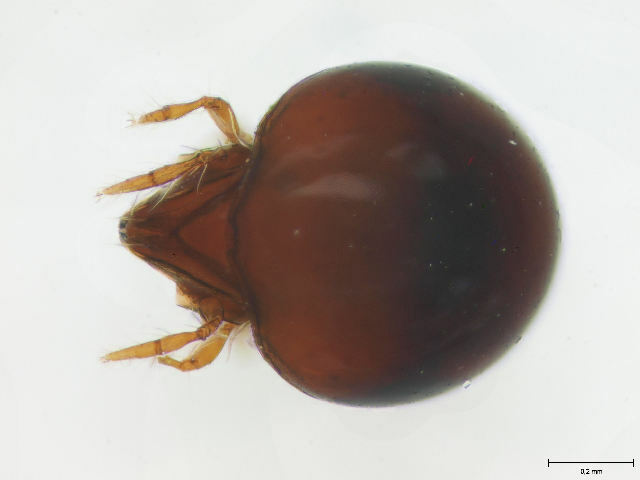 The type subgenus of the genus Liacarus is a subcosmopolitan group of oribatid mites found in soil litter. The type species, L. nitens, is a member of a group of species with narrowly fused lamellae bearing narrow cusps and a sharply pointed interlamellar mucro. Characters (from Balogh & Balogh 1992): Prodorsum with narrow lamellae, converging apically, lateral parts of prodorsum usually uncovered; sensillus fusiform. Humeral region of notogaster with two pairs of setae c1 and c2 near each other. Genital plates with six pairs of setae. Legs tridactyle. [CH98] Colloff, M. J.. & R. B. Halliday. 1998. Oribatid Mites: A catalogue of Australian genera and species. CSIRO Publishing: Collingwood. [G36] Grandjean, F. 1936. Observations sur les oribates (10e série). Bulletin du Muséum, 2e série, 8 (3): 246–253. [G41] Grandjean, F. 1941. Statistique sexuelle et parthénogenèse chez les oribates (acariens). Comptes Rendus des Séances de l'Académie des Sciences 212: 463–466. [W72] Woolley, T. A. 1972. The systematics of the Liacaroidea (Acari: Cryptostigmata). Acarologia 14 (2): 250–257. Last updated: 16 December 2018.